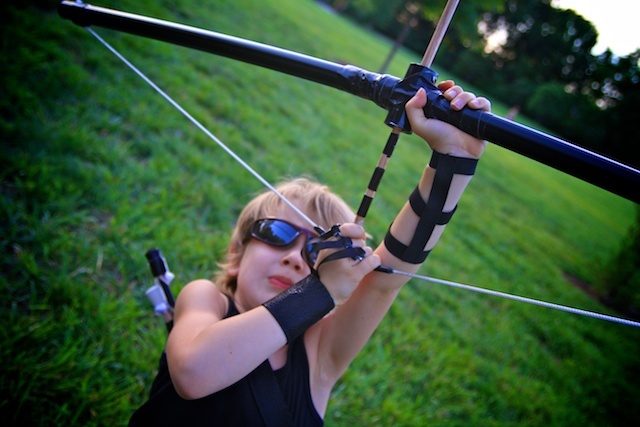 It was so much fun to look at Hawkeye pictures and create the different equipment he is wearing to fit my son! 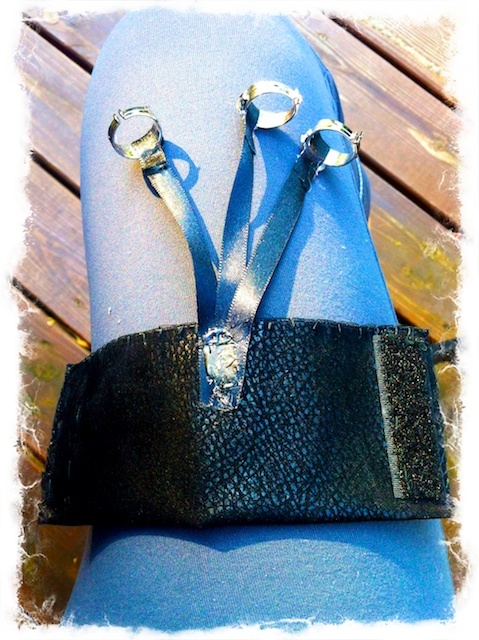 In this post I will show you how I made the Armguard, which in definition is a protective covering for the wrist and/or arm from being scraped by the bow string & the Finger Glove, which is used to protect your fingers from the string while also allowing the string to slide smoothly off your fingers. 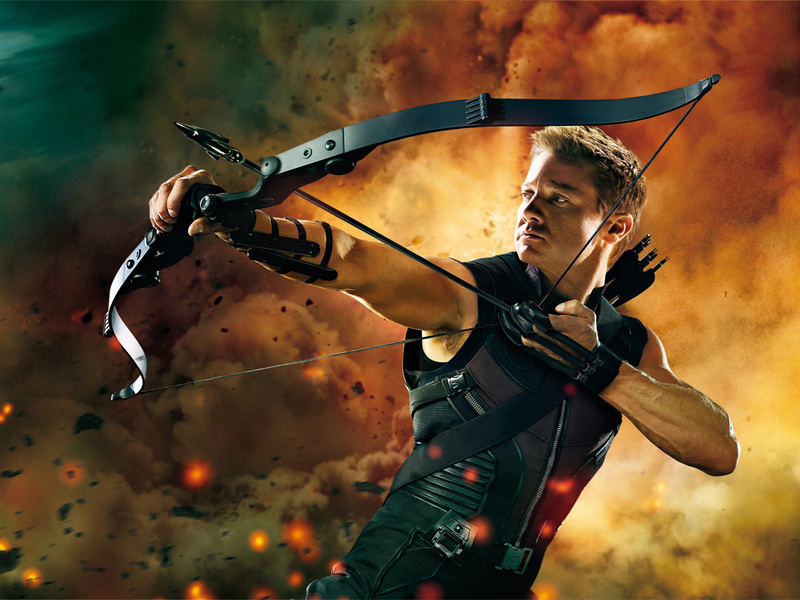 Obviously, for the PVC bow, you don't really NEED these but you look REALLY cool wearing them and it's part of the costume if you want to look like Hawkeye! 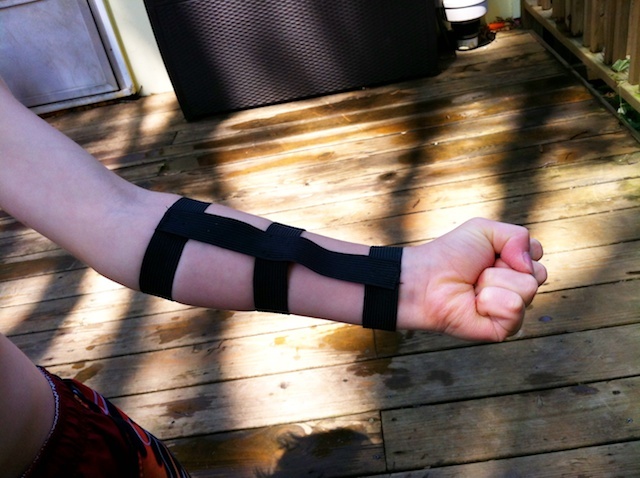 All I did was measure my sons arm in three different spots between his wrist and elbow. 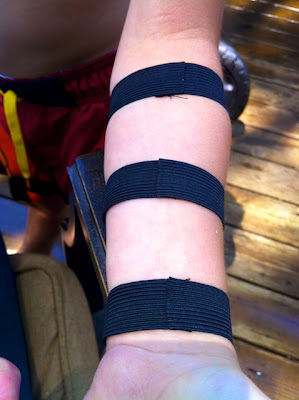 You want the elastic right by the elbow (pictured) to be tightest so the Armguard doesn't fall down when they are playing! Leave a little extra elastic so you can hand stitch it together. Pictured below are my three different lengths of elastic. They will get smaller as you measure down to the wrist. 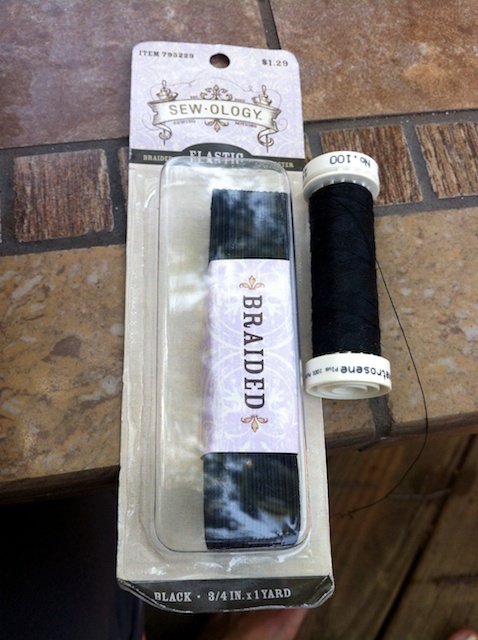 Then all you do is overlap a little and hand stitch together with a needle and thread! Simple as that! 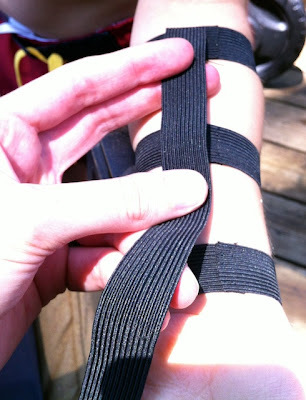 After you have all three circles of elastic sewn, put them on your child's arm and then measure out a strip of elastic that will connect all three together. This will also cover up your seems. 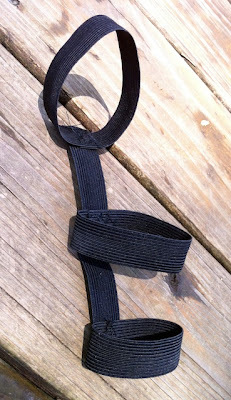 Here is a picture after I hand stitched the three circles of elastic to the long strip! I can't give you any exact measurements because each child will be different. 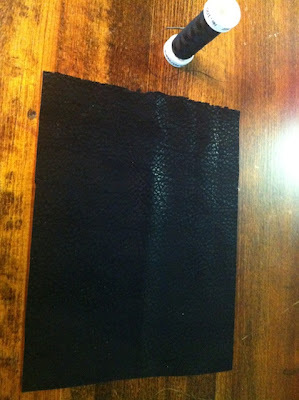 I went to the fabric store and found this AWESOME black fabric that looked like leather and bought the smallest amount they would let me, which was 1/8 of a yard. I also used this same fabric to make the Quiver (the carrier for your arrows), Part 3 post which you will have to check back for in a few days. So you will use most of it! 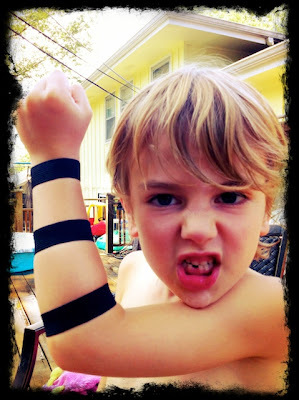 First thing I did was measure the length of the fabric around my sons wrist. 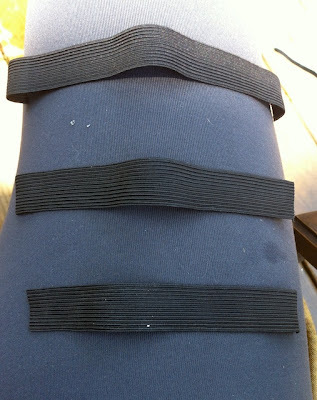 I left about an inch overlap for the Velcro. Then I folded the fabric in half. I wanted a nice thick band and a good edge but if you don't care, you can just simply cut the width of the rectangle without folding over and sewing. There is also no exact measurement to the width of the band. Just eye it with your child to see what you both like! 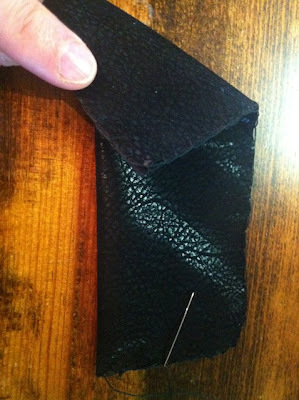 I then hand stitched the fabric together around the three edges! 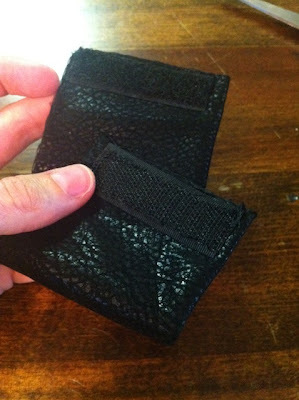 You measure your black velcro to fit the band at each end and then hand stitch it on! For the next step you need three plastic party rings. 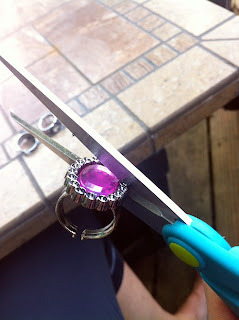 With good scissors, be careful and cut the jewel off the top leaving a plain plastic band. 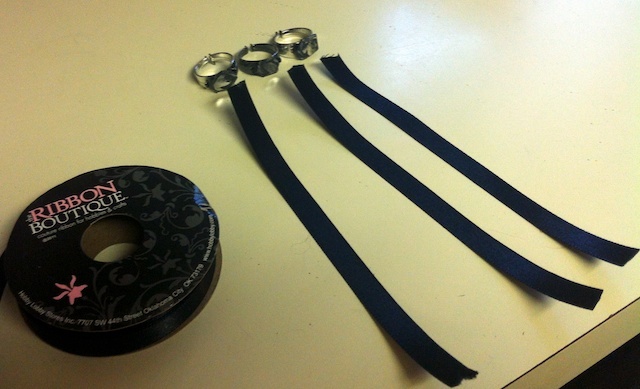 Now that you have three plain rings you need to cut three long pieces of black ribbon. 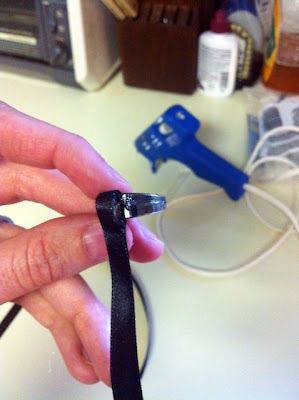 You simply fold the ribbon over the top of the ring and hot glue it down. 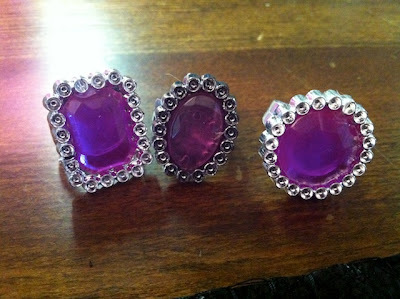 When you have all three done, put them on your child's three middle fingers and see how they meet in the center. I then took them off my child and hot glued them together at the bottom. You can kind of see where I glued the string together in the picture on the right. 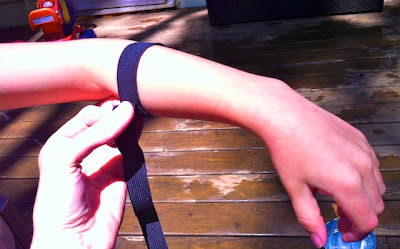 The string needs to be long enough to reach your child's wrist. 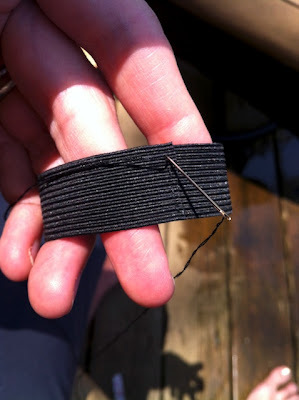 I then hand stitched the ribbon to the backside of the fabric wrist band. VERY IMPORTANT: you will want to try the rings and the wrist band on your child before sewing just so you get the ribbon sewn in the right spot!!! THERE YOU HAVE IT, an awesome finger glove! 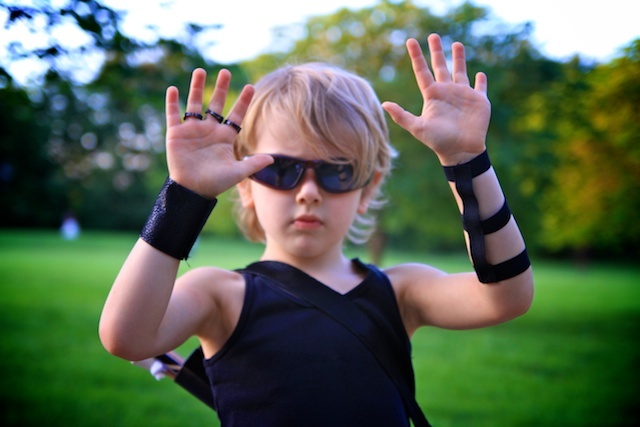 Let me tell you, my son wears these EVERYWHERE!!! They are fun even to make for "spy gear". 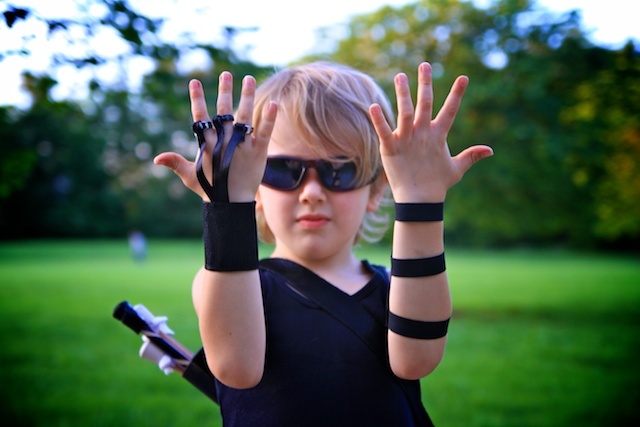 I know a few of my son's friends that would LOVE Finger Gloves to wear just for play! Maybe future birthday presents! 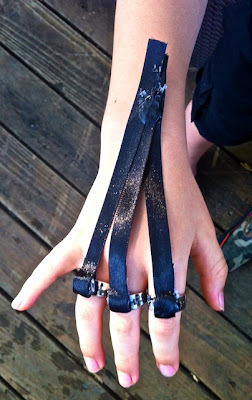 *Another fun Idea which I might post about would be a fun dress up glove for your girly girl! You can keep the jewel on the ring and add her favorite color ribbon and pretty fabric that she picked out and make a pretty wrist bracelet. Get creative for your dress up box! This is who my son wants to be this year. Thanks for the great craft ideas!